Kryssa runt den seriösa Tigre Delta och upplev spänningen av tango med denna fantastiska Buenos Aires combo tour. Först utforska provinsstäderna San Isidro och Tigre på en halvdagstur, inklusive en 40-minuters katamaranskryssning runt de stilla husen och öarna i Tigre-deltaet. Sedan tillbringa en oförglömlig kväll på La Ventana Tango och njut av en spektakulär tango show, tillsammans med levande musiker och en läcker 3-rätters middag. Njut av stort värde genom att kombinera två bästsäljande turer till en! The Tigre boat tour was very good and so interesting to see how the people lived on the river and islands. There was an English commentary on the boat that gave a lot of information.The tango show was superb with professional dancers portraying the history of the tango through the years. The singers were excellent as well. Would highly recommend it. The vendor clearly had us at the wrong hotel so we had to go to a meeting place because we were so far outside of the city; however, the meeting place was 2 blocks from our hotel. For the second part of the excursion this meant we were waiting in a random hotel lobby for more than an hour. The tango show was good, but the start required a lot of random waiting around to be seated and to give in ones tickets. Overall could be streamlined. Also the show involved more singing than actual tango. Tour guild Camille was great very nice fun and knowledgeable. So kind to everyone at the ranch. It was a lovely day the ranch, food, wine and dancing very memorable very talented people. The Gaucho that greets you pretty much does everything from serving steaks to riding and doing the ring thing to being a very good dancer. We also enjoyed the museum and the horses were beautiful a fun day. Camille tells about the city on the way out and tells us how to prepare the drink they like Mate. Sort of like a very strong tea. The Buenos Aires Combo Tour and Tango Diner Show were both amazing! 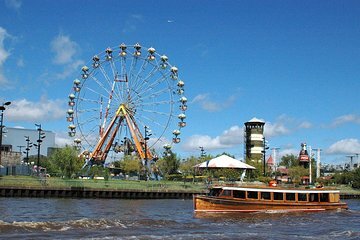 We would highly recommend it to anyone that wants to experience the real Buenos Aires! The tour company was very professional, called the day ahead to confirm what time they would be picking us up at our hotel. It was a great experience all around!